While this season is progressing much quicker than last year, one thing is remaining the same — lots of rain. With the rain, several diseases are starting to show up or are expected to show up during the next month. SDS has really started to show up across the state this past week. We received reports of it in most areas of the state. SDS can be identified by the characteristic yellowing between the veins, but be sure to split stems to distinguish it from brown stem rot. Sudden death syndrome, Iowa State University photo. During the past week we have seen a few fields with plants starting to die from Phytophthora root rot. This disease often shows up a few weeks after excessive rains. Lower stems have characteristic dark purple-brown lesions that extend up from the roots of the plant. There have been a few scattered reports of white mold, but nothing close to last year's outbreak, which was the first major outbreak of white mold in almost a decade. While this year has been warmer, there is still a risk of white mold developing. Fields at a higher risk of getting white mold are those that had disease in previous years and are in high-yielding sites where the canopy closed early. Also, fields that have had plenty of soil moisture, high humidity and little airflow have increased chances of getting white mold. I honestly have not seen stem canker in Iowa yet this year, but there have been reports of stem canker from neighboring states. Stem canker symptoms include slightly sunken brown lesions that occur near the base of the stem. It is common for stem canker to be misdiagnosed as Phytophthora root rot. Look for green stem tissue near the soil line to diagnose stem canker. Stem canker, Iowa State University photo. What good would it be to identify these diseases this late in the season? 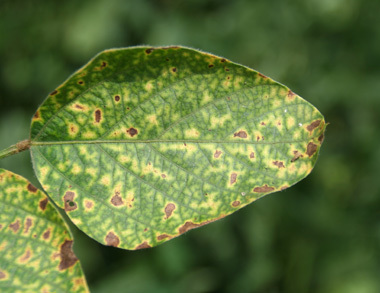 Foliar fungicides are either not effective for sudden death syndrome or Phytophthora root rot, and are not effective after symptoms have developed for white mold and stem canker — thus fungicide applications are not recommended. There still is some value in scouting. Locating "hot spots" of these diseases may trigger management strategies to reduce inoculum (i.e., the pathogen) in subsequent years. If you have white mold, you can reduce the number of sclerotia by apply a biological control to kill the sclerotia or perhaps tillage. Tillage and crop rotation are not effective management strategies for Phytophthora root rot and sudden death syndrome. Remember the pathogens for these diseases can survive over two years in the soil. Also, knowing what fields are prone to getting these diseases may influence what cultivar you plant the next time that field is in soybeans. This is especially true for sudden death syndrome, Phytophthora root rot and white mold since cultivars with tolerance and/or resistance are available. Finally, you can take extra precautions to keep your combine clean of soybean stems and residue after harvesting fields with white mold. This will help prevent spreading the fungus to new fields. While there is little you can do for management of these diseases this year, information from scouting your fields may help with management in the future. Daren Mueller is an extension specialist with responsibilities in the Corn and Soybean Initiative. Mueller can be reached at (515) 460-8000 or by email at dsmuelle@iastate.edu. Alison Robertson is an assistant professor of plant pathology with research and extension responsibilities in field crop diseases. Robertson may be reached at (515) 294-6708 or by email at alisonr@iastate.edu. Links to this article are strongly encouraged, and this article may be republished without further permission if published as written and if credit is given to the author, Integrated Crop Management News, and Iowa State University Extension and Outreach. If this article is to be used in any other manner, permission from the author is required. This article was originally published on August 2, 2010. The information contained within may not be the most current and accurate depending on when it is accessed.